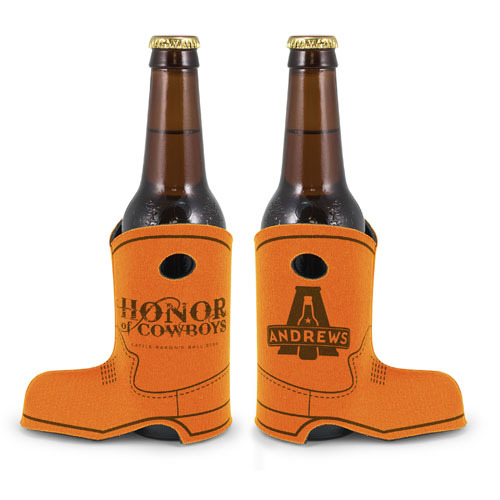 Our premium scuba foam boot bottle koozies can be personalized with your choice of artwork and theme. Go crazy and make your boot and your ink color from our many stock colors or customized ink for a small additional fee. 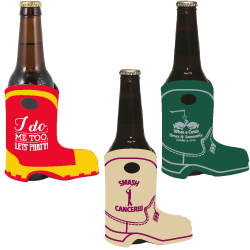 Each boot theme bottle koozie can be personalized with the theme of your choice for no extra charge. 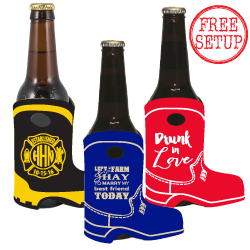 Choose from Cowboy Boots, Fireman Boots or no theme.. Our boot koozies will delight your guests or family with a unique theme………for the firefighter, cowboy or cowgirl in your life, or for a western event you will dazzle your crowd with these themed or plain colorful boots. After you place your order you will receive a free email proof from our expert team of designers.